Wolverhampton's first workhouse was erected in 1700 at the top of Horseley Fields. Its location is shown on the 1750 map below. Horseley Fields workhouse site, c.1750. Also in 1700, the parish of Bilston opened off the High Street, at what became known as Workhouse Fold. It occupied a house owned by John Wooley of Ye Bull. The first inmates, on March 23rd, 1800, was Widow Bennet. The contract between Wooley and the parish also stipulated that the workhouse inmates could make use of a portion of Mr Wooley's garden "as will conveniently take half a hundred of plants". The Willenhall workhouse was erected in around 1741 on land at the rear of houses at the east side of Stafford Street, with its entrance on Little Wood Street. A parliamentary survey in 1777 recorded parish workhouses in operation at Bilston (for up to 60 inmates), Willenhall (25), and Wolverhampton (60). County of Stafford: Bilston (8), Wednesfield (2), Willenhall (3), Wolverhampton (12). The population falling within the union at the 1831 census had been 46,937 with parishes ranging from in size from Wednesfield (population 1,879) to Wolverhampton itself (24,732). The average annual poor-rate expenditure for the period 1834-36 had been £9,021 or 3s.10d. per head of the population. The first Wolverhampton Union workhouse was erected in 1836-8 on Bilston Road. 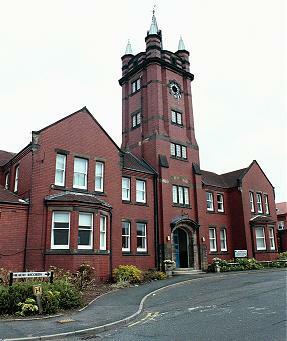 Its construction cost around £9,000 and it could accommodate 750 inmates. It is believed to have been designed by George Wilkinson and adopted the relatively uncommon "St Andrew's Cross" plan which Wilkinson had also used at Chipping Norton and Witney. An entrance range faced towards the entrance at the north of the site. This connected to a central supervisory hub from which radiated four accommodation wings for the various classes of inmate (male/female, old/young). The areas between the wings formed enclosed exercise yards. The location and layout of the Bilston Road site are shown on the 1901 map below. Wolverhampton Bilston Road site, 1901. Various additions were made to the buildings including an infirmary, new infectious wards in 1867, and new accommodation wards in 1881. The capacity of the workhouse eventually reached 1,000. However, the situation of the site, hemmed in by houses and factories made any further expansion impossible. Smoke from adjacent factories also made the air in the vicinity very polluted. Faced with ever increasing demands on space, in 1885 the Guardians even resorted to sending 50 inmates to the Westbury-on-Severn Union which had spare capacity. In 1842, the Commissioners investigating the employment and conditions of children in mines and manufactories, discovered that workhouse boys, some as young as eight, were being sent on "apprenticeships" of up to twelve years working in coal mines. As a result, some unions in the coal-mining districts of South Staffordshire and adjacent areas were asked to provide detailed information on the children who had been apprenticed in the mining industry in recent years. The return for the Wolverhampton Union covering the years 1840-41 is included below. In each case, the child was apprenticed, without any premium being paid, until they reached the age of 21. The list also included one girl, Mary Griffiths, who it was noted would probably act as a domestic servant, again until the age of 21 or until she married. On Monday the 13th inst. Ja's Chadwick and Tho's Nokes absconded with the Union Clothes on and went off with Mary Doughty & Emma Allen two young women with whom. I understand a correspondence has been carried on. through the men having access to the Garden to go to the temporary Privy erected near the women's yard. Nokes came in with the Venereal Disease and Emma Allen is the tall girl who applied to you a fortnight since for clothes, to go as she said to service. If the temporary privy be removed from the Garden to the Stone Yard, one source of mischief will be cut off and much conduce to the order of the establishment. I believe it may be done by men at present in the House with a Shovel & the requisite quantity of buckets. On Wednesday last John Shaw, belonging to the parish of Wolverhampton who absconded in July last with the Union dress on having a child here was apprehended and committed to hard labour for 3 months. The Bell Rope to the House Bell is again broken — (near to the top) I would recommend that a chain be fixed there instead of roping on account of the action of the atmosphere. 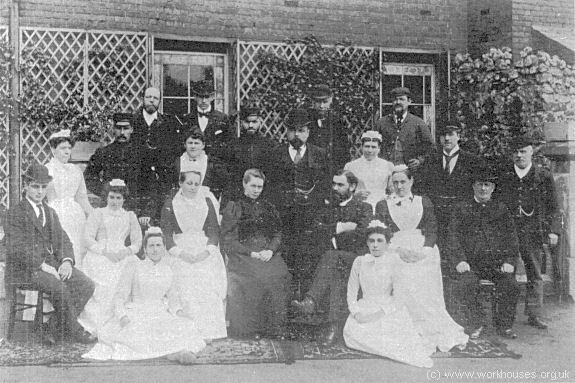 Bilston Road workhouse staff, c.1900. The Master, Mr E Sattin, is standing at the centre. In 1867, Wolverhampton was the subject of one of a series of articles in the medical journal The Lancet investigating conditions in the country's workhouse infirmaries. Although the report was generally positive, it also included a number of critical comments: many of the wards were overcrowded; the kitchens and system of food distribution were inadequate; the reception and tramp wards were 'very bad'. Further details of the Lancet inspection are in the full report. Some temporary relief to the overcrowding at the workhouse came in November, 1890, when the Union opened its Wednesfield Cottage Homes. Within a few years, however, things had reached crisis point. Under increasing pressure from the Local Government Board, the Union finally agreed to build a new workhouse. A site was found at New Cross in Wednesfield where 50.5 acres of land were purchased for the sum of £11,218. The design of the new buildings was opened to competition with the winning entry coming from Arthur Marshall of Nottingham. The foundation stone for the new complex was laid in September 1900 by Chairman of the Guardians, Mr Price. 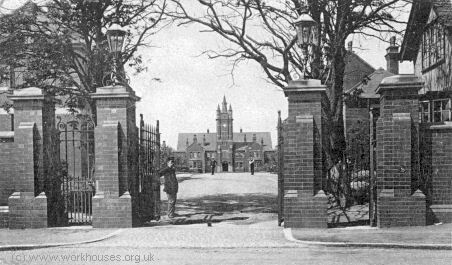 The workhouse was formally opened on 24th September 1903. 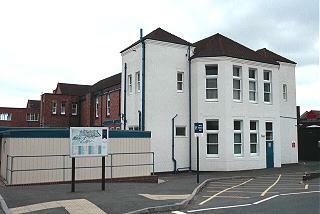 The Bilston Road buildings were then closed and demolished. The new workhouse could accommodate up to 1,246 inmates, 20 nurses, and 60 other officers. The total cost of the buildings, which themselves occupied an area of six acres, was a (then) massive £156,879. The location and layout of the New Cross site is shown on the 1919 map below. 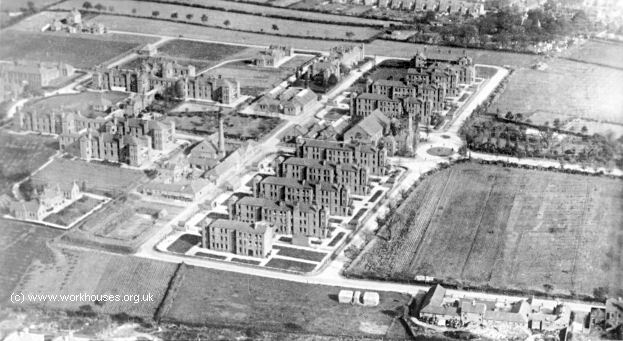 Wolverhampton New Cross workhouse aerial view from the south-west, 1930s. At the site entrance to the south were a lodge and receiving wards and the Union Board's Offices. Wolverhampton New Cross entrance from the south, 1909. Wolverhampton New Cross Board offices (left) and receiving block (right), 2000. The main administration block stood at the end of the entrance driveway. Wolverhampton New Cross administration block from the south, 2000. The dining hall at the rear of the administration block could seat 800 people. Wolverhampton New Cross dining hall and kitchens from the north, 2000. The easternmost of the workhouse accommodation blocks was for sixteen married couples. Wolverhampton New Cross married couples' block from the north-east, 2000. The infirmary section at the north of the workhouse comprised six pavilions with a single storey connecting corridor running east-west. In addition, there were separate ward blocks for skin and syphilitic cases. A nurses home was located at the west of the site. Wolverhampton New Cross infirmary pavilion from the north, 2000. 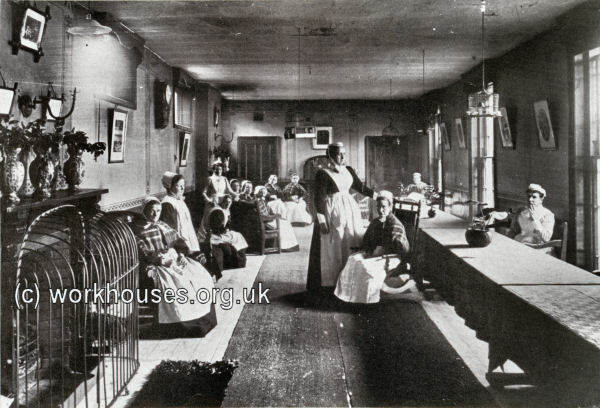 New Cross workhouse women's day room, early 1900s. 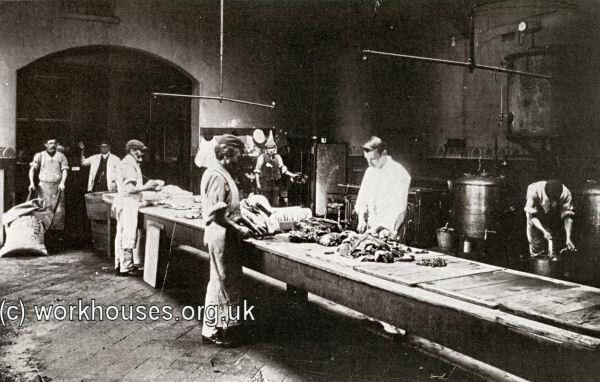 New Cross workhouse kitchen, early 1900s. 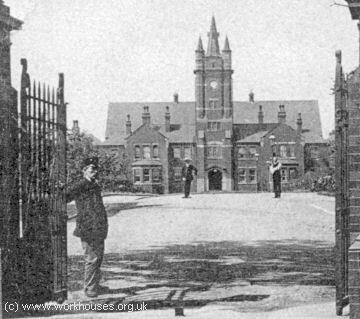 After 1930, control of the workhouse site passed to the Wolverhampton Public Assistance Committee and it became New Cross Hospital. Many of the old workhouse blocks have now been replaced by modern buildings. Wolverhampton Archives and Local Studies, Wolverhampton City Council, Molineux Hotel Building, Whitmore Hill, Wolverhampton WV1 1SF. Holdings include: Guardians' minute books (1839-1915); Inmates of cottage homes (1890-1930); etc. Poor Law in Wolverhampton 1870-1900 by David E Wood (1986, unpublished dissertation).